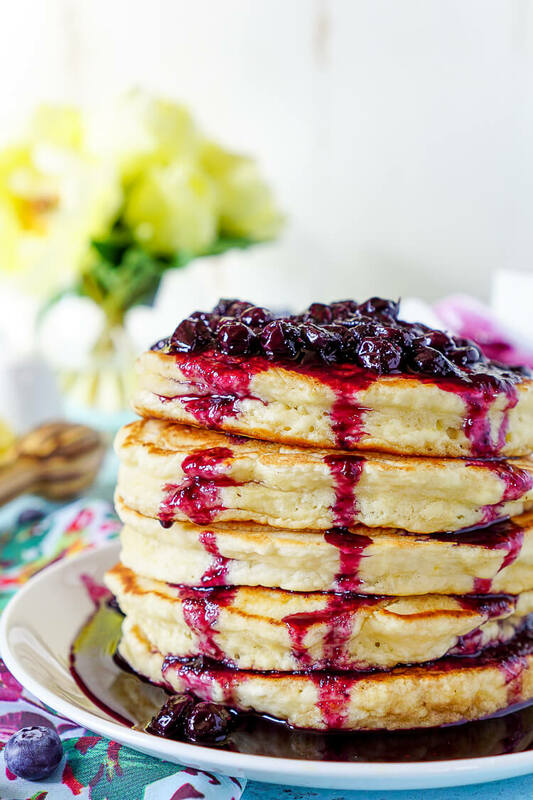 These Lemon Ricotta Pancakes are fluffy and laced with zest, then topped with a homemade Blueberry Honey Syrup for a sweet finish! Yesterday morning my giant golden retriever was kind enough to inform me that mud season has officially arrived here in Maine. And while I don’t so much love swiffering the floors multiple times a day, I’m excited for what’s to come! But even though the days are warming up, the cold ones still make themselves known. Therefore, on the weekends, we’re still looking for that perfect breakfast that’s got all the coziness of winter with the flavors of spring! 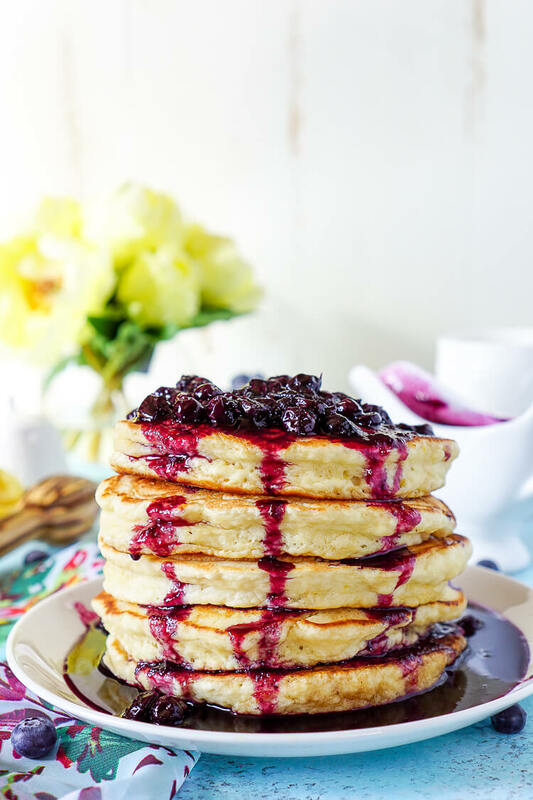 These Lemon Ricotta Pancakes are just the thing, and when you top them with this easy Blueberry Honey Syrup, it’s a flavor explosion in your mouth! Even my husband who is not a “fruit pastry guy” – apparently pancakes are pastries now, who knew! 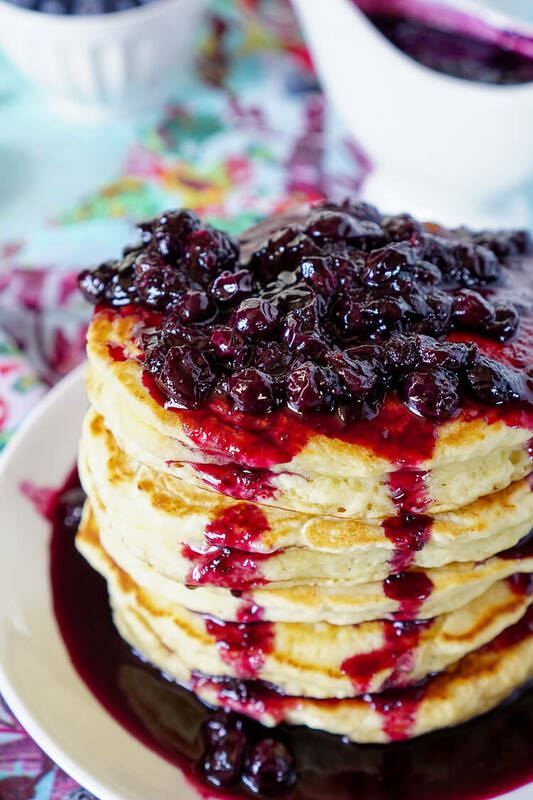 – loved the texture of these pancakes. The pancakes are dense while still maintaining a fluffiness and the lemon shines through strongly. 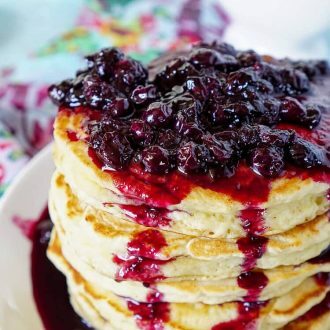 Then there’s the syrup, made with just four ingredients it’s simple and sweet and perfect for topping these lemon laced pancakes or frankly anything for that matter. Pancakes, waffles, ice cream, you name it! 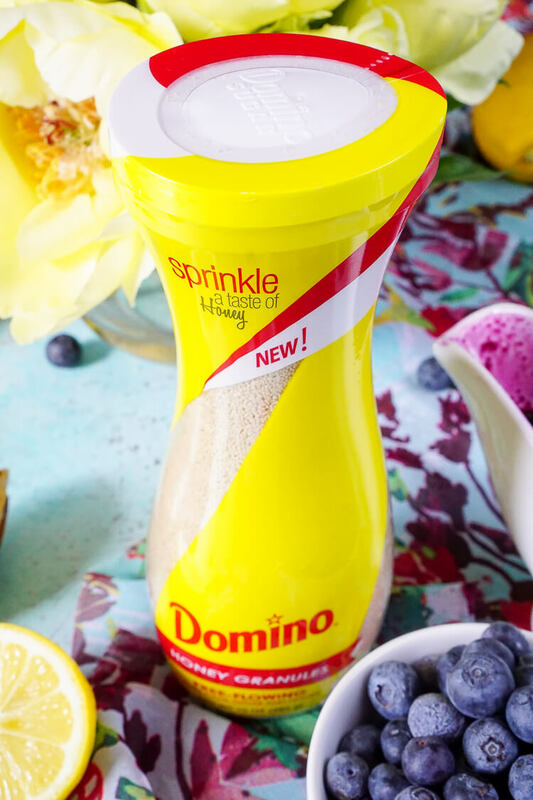 I made it using new Domino® Honey Granules, a free-flowing mix of granulated pure cane sugar and honey and is available in easy-pour canisters with recloseable flip-top lids. It’s perfect for making delicious syrups like this one or for sprinkling a taste of honey into your drinks and cereals! For me, these pancakes were the perfect weekend brunch: hot, delicious, and comforting. 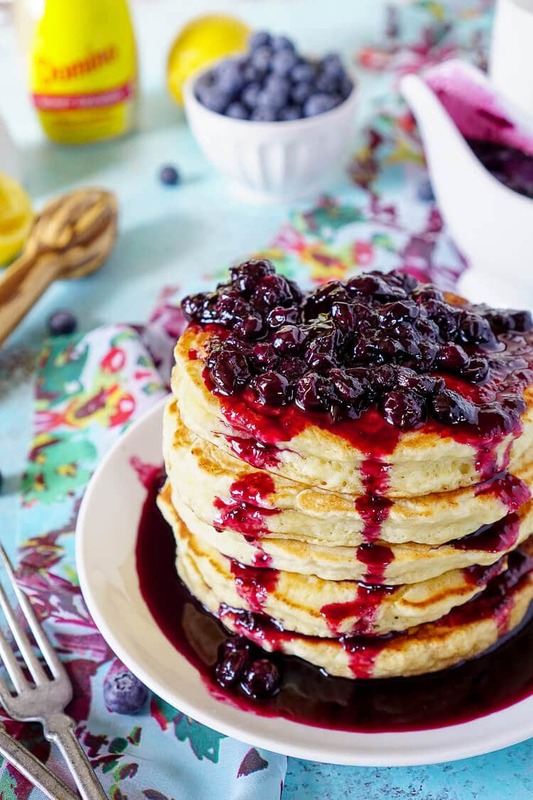 The slight taste of honey blends beautifully with the blueberries and when that syrup drenches down into the fluffy lemon pancakes, your taste buds will start to do a happy dance! And while I’m excited to see what else I can make with Domino® Honey Granules, my husband has been mixing them into his iced tea like crazy! Gotta love a versatile product! Domino® Honey Granules can be used in many different types of recipes as a substitute for either some, or all, of the granulated sugar called for in the recipe. Domino® Honey Granules can often be substituted for fluid honey by using this conversion: 1 cup liquid honey = 1 cup Domino® Honey Granules + ¼ cup additional recipe liquid. Domino® Honey Granules is sold where I live, but if they don’t sell it in your area, look for C&H® Honey Granules, the sister brand of Domino®. In a large bowl, not a stand mixer, combine flour, sugar, baking powder, baking soda and salt. In a separate bowl, whisk together milk, ricotta, lemonade, eggs, and zest. Add wet ingredients to dry ingredients and stir until just combined. The batter should be a bit lumpy, do not overmix. 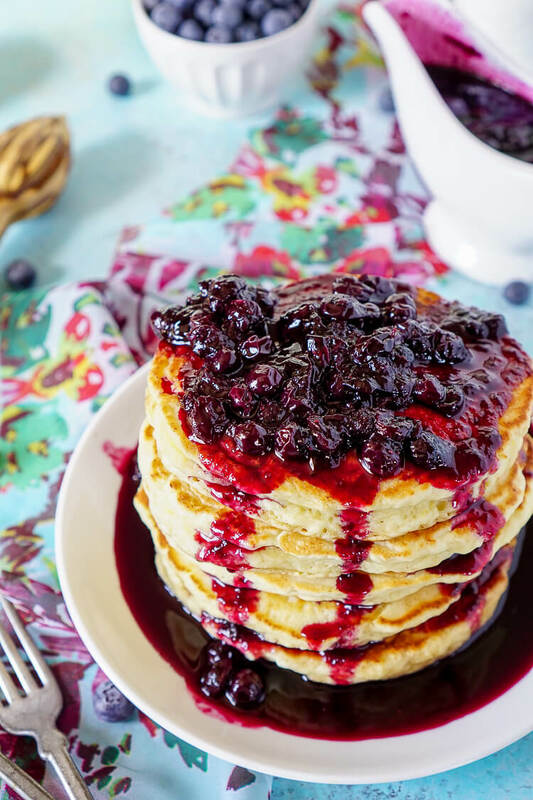 While you're cooking the pancakes, add blueberries, water, Domino® Honey Granules, and lemon juice to a medium sauce pot and simmer for 15-20 minutes until blueberries burst and a thick syrup begins to form. Make sure to stir frequently and press the berries against the side of the pan to pop them. Pour warm syrup over finished pancakes! I made pancakes with ricotta recently and they have the most amazing texture! For my recipe, I put the blueberries in the pancakes, but your sauce sounds incredible. I’m going to try this soon! Oh, I know! 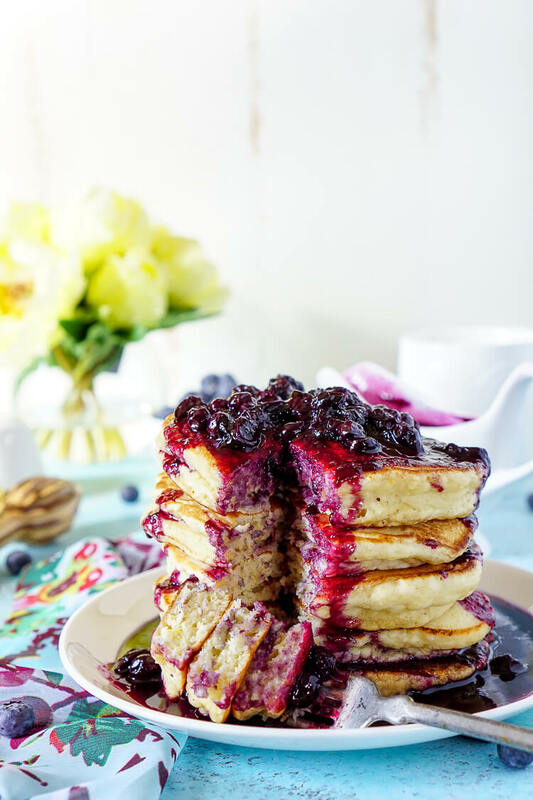 Ricotta pancakes have an incredible texture and I bet blueberries cooked right in would be delicious!